For a long time, there has been no industry standard for setting the warmth rating of sleeping bags. Manufacturers were free to label their sleeping bags as they saw fit, leading to great disparity between companies’ ratings. For example, The North Face is notoriously optimistic; Marmot is generally conservative. Consequently, a +15 degree bag from Marmot is almost always warmer than a +15 from TNF. Plus there has always been widespread confusion about what the temperature ratings are supposed to indicate. The lowest temperature you’ll sleep comfortably? Or survive the night? 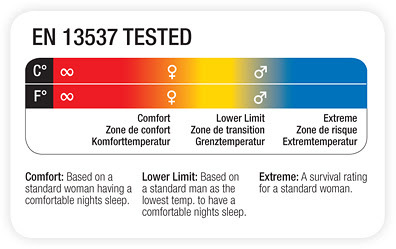 The red, orange, and yellow areas indicate the comfort zone, or the maximum and minimum temperatures in which a user would sleep comfortably. Women tend to sleep colder than men, thus the lowest comfort temperature for women is higher (indicated by the female symbol in the orange area) than men (male symbol in light blue section). At the far end of the spectrum is the survival rating, or “extreme” minimum temperature at which a woman would survive the night without getting hypothermia.